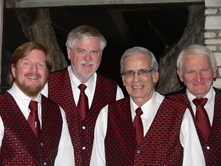 Bill’sBari Pie is a quartet whose members all belong to the Barbershop Harmony Society. In addition to this quartet, the four gentlemen are also members of the San Fernando Valley Chapter, Valley Harmony Singers Barbershop Chorus, a larger group which also sings 4-part harmony. The 4 parts are Lead, Baritone, Tenor, and Bass. Since a barbershop quartet has to have all 4 parts, 2 of the Baritones have to sing the Lead & Tenor parts in the quartet. The 4 members of Bill’sBari Pie are Mathew Schreiber (Lead), Bill Cohen (Bass), Kirk Prather (Baritone), and John Wright (Tenor). Barbershop singing is their hobby. The quartet members are also busy with other pursuits. Mathew is a piano tuner with his own business, Aapex Piano Service. Bill retired two years ago, after 30 years as Corporate Counsel for ValleyCrest Landscape Companies. John Wright attended Occidental College, is also retired, and has been singing barbershop for more than 25 years. Kirk Prather has retired from a full-time career as an engineer and has his own consulting firm. That’s a little background about the quartet, which has been entertaining audiences ever since its formation. For several years, they serenaded diners annually on Valentine’s Day at Cosmos Grill in Calabasas. They have performed at the Masonic Lodge in Van Nuys, the Annual Chatsworth Dance Studio Show, the Valleyaires Barbershop Chorus Annual Show, and the Annual Valleyaires Ice Cream Social. Most recently, they have performed for the La Canada Leisure Club, at a 50th Anniversary Party at Shanghai Red’s Restaurant, and at the Children’s Community School. 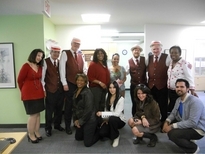 Also, their performances include Singing Valentines, private birthday parties, and other events. 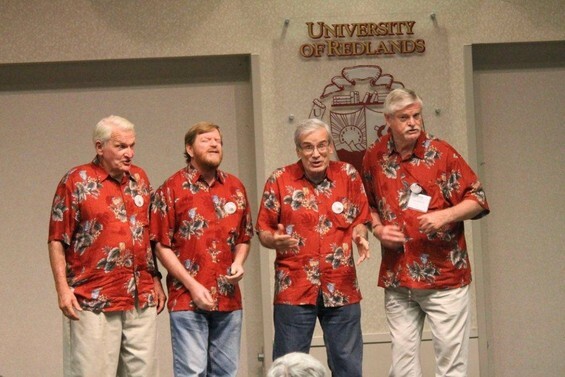 In 2012, they attended Harmony College West at the University of Redlands, to perfect their quartet skills.